The summer before her freshman year of high school, Beatriz Collazo rode a school bus from her home in Watsonville to the UC Santa Cruz campus. There, she and two dozen other girls spent a week exploring the world of computer science and engineering as part of the university’s Girls in Engineering program. Now 26 and with a degree in bioengineering from Stanford University, Collazo covers nearly the same miles five days a week. But this time, it’s for the career she always wanted as a manufacturing manager at a thriving Santa Cruz medical device company. “Girls in Engineering helped plant a seed,” she says. Started in 2006 with a grant from the Peggy and Jack Baskin Foundation, Girls in Engineering each summer offers 50 middle-school-aged girls the chance to do hands-on programming, learn about career options, and tour women-run science labs like that of vaccine-hunter Rebecca DuBois, a UC Santa Cruz assistant professor of biomolecular engineering. It’s just one of several efforts at UC Santa Cruz to draw and keep more women in engineering and computer science, fields known for being testosterone-heavy both in the classroom and at work. According to the National Center for Educational Statistics, 37 percent of undergraduate computer science students in 1984 were women. By 2006, that number had dipped to 12 percent, according to the Computer Research Association Taulbee survey, and last year it was 19 percent. Other campus efforts to change technology’s gender imbalance include a popular Women in Science and Engineering group, an active Society of Women Engineers chapter, and fellowships for female engineering students, along with support at the UC Santa Cruz Women’s Center. The campus’s Center for Innovation and Entrepreneurial Development draws a larger percentage of women than more-traditional computer science and engineering classes, according to Sue Carter, professor of physics and the Narinder Kapany Professor in Entrepreneurship, who heads the center. It runs programs like the intensive eight-week Summer Entrepreneurship Academy, which lets students develop and build their own business ideas; and Idea Hub, which helps students from a variety of disciplines—from engineering to arts and the humanities—create solutions to real-world problems with the aid of mentors and networking. 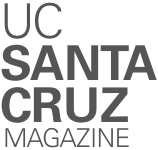 Carter, who was chief technical advisor or scientific founder for four startups, says UC Santa Cruz’s entrepreneurship programs draw 30–40 percent women. In addition, not only are there more African American and Latinx students in her entrepreneurship programs than in traditional engineering programs, but also this diverse group has come up with some pioneering ideas. Says Carter, “…if you get people who have experienced a lot of different things, they tend to come up with innovative solutions” for the problems everyone faces.